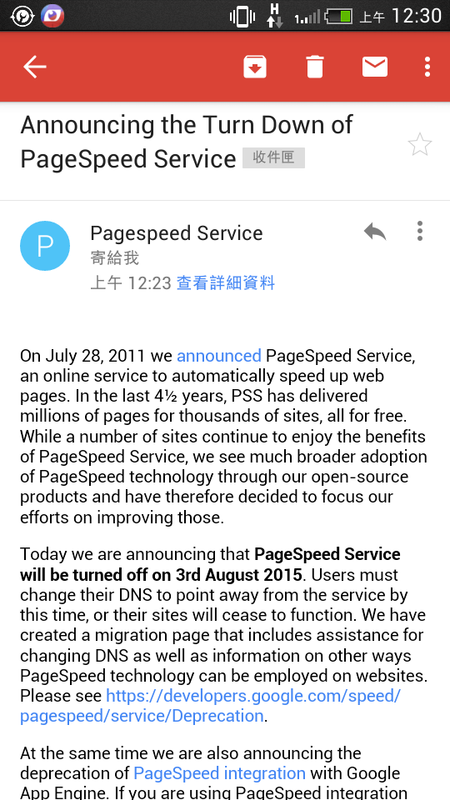 On July 28, 2011 we announced PageSpeed Service, an online service to automatically speed up web pages. In the last 4½ years, PSS has delivered millions of pages for thousands of sites, all for free. While a number of sites continue to enjoy the benefits of PageSpeed Service, we see much broader adoption of PageSpeed technology through our open-source products and have therefore decided to focus our efforts on improving those. Today we are announcing that PageSpeed Service will be turned off on 3rd August 2015. Users must change their DNS to point away from the service by this time, or their sites will cease to function. We have created a migration page that includes assistance for changing DNS as well as information on other ways PageSpeed technology can be employed on websites. Please see https://developers.google.com/speed/pagespeed/service/Deprecation. At the same time we are also announcing the deprecation of PageSpeed integration with Google App Engine. If you are using PageSpeed integration on Google App Engine, it will continue to function until 1st December 2015, after which PageSpeed optimizations will no-longer be applied to your app. No action is required on the part of App Engine users; after this date apps will continue to operate, except without the benefit of the PageSpeed optimisations. Users that wish to pre-emptively disable PageSpeed can follow the instructions at https://cloud.google.com/appengine/docs/adminconsole/pagespeed#disabling-pagespeed. The open source PageSpeed server modules mod_pagespeed and ngx_pagespeed and the PageSpeed Optimization Libraries are unaffected by this announcement and development on these will continue. The PageSpeed team. Google Inc. 1600 Amphitheatre Parkway, Mountain View, CA 94043 You have received this mandatory service announcement to update you about important changes to Google PageSpeed Service or your account.